The one thing I will miss the most about summer is a perfectly vine-ripened tomato. Sure there are hothouses nowadays that grow tomatoes year round, but there is just something about a ripe, juicy, bright red tomato that can't be found in any season but summer. As the day gets dark earlier and the air gets crisper even here in sunny California, I realize that the days of flavorful summer tomatoes are coming to an end. I found some beautiful cherry tomatoes and decided to oven-roast them--further concentrating that phenomenal flavor and turning them into tiny precious morsels of tomato-y goodness. 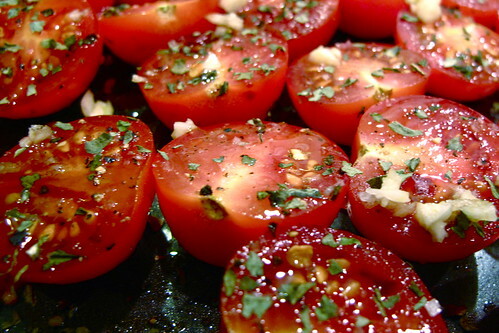 2. cut tomatoes in half--use whatever kind of tomato you can find that is a pleasing shade of red (I prefer cherry or a nice roma tomato)--and place on a cookie sheet, cake pan...anything to put in the oven! Voila! 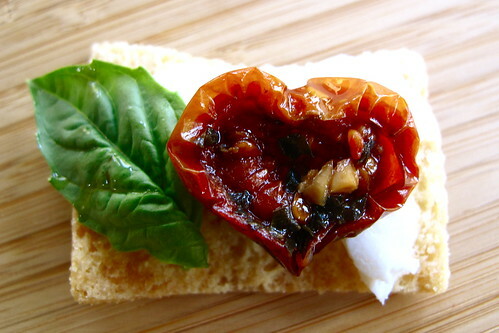 delicious oven-roasted tomatoes! 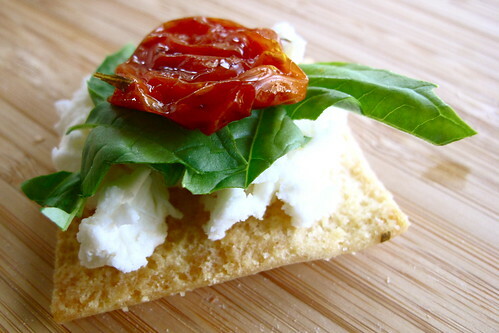 I put them on pita chips with a little bit of fresh mozzarella and fresh basil. Each bite was a flavorful party in my mouth! I am trying that the next time I get my hands on cherry tomatoes. 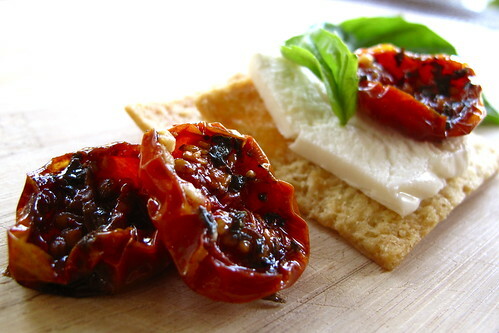 mmm love tomatoes and sun dried tomatoes.. i've always been hesitant to oven roasting my own. Thanks for sharing this recipe! I tried it at home with some vine-ripened tomatoes and used the juices with some angel hair pasta, topping the dish with the tomatoes. It was a hit! So excited to finally try this. My Dad gave me a a good amount of home grown cherry tomatoes (about 60) so I have them in the oven now. Thank you for this wonderful Recipe!